When it comes to interior design for the modern teenage girl’s bedroom, it’s often challenging to find ideas that are fresh and original! Should you go with a theme? If so, which style will make a strong statement without being overpowering? Once basics such as wall color and bedding have been selected, how does the room come together in a way that is unique? Today we answer these questions with the help of some inspirational pictures. The rooms below are modern, and they stand out precisely because they put a different spin on teen decor. 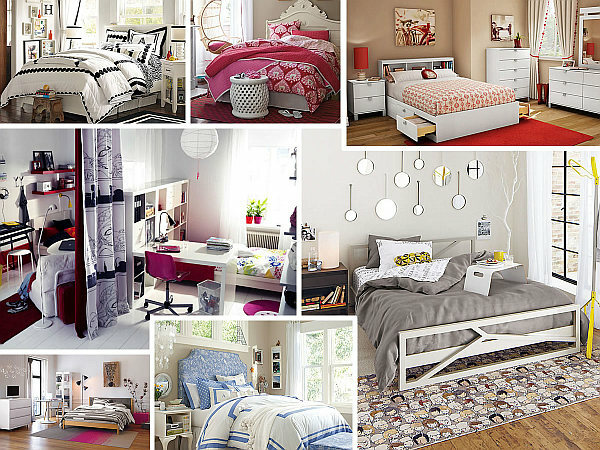 The pics are polished and sleek, but we all know that the rooms of most teenagers have a “lived in” look, so envision the spaces below with a few more posters on the wall, a school bag on the desk chair and some stuffed animals on the designer bedding! See something you like? We’ve included links to product information where possible. Happy perusing! 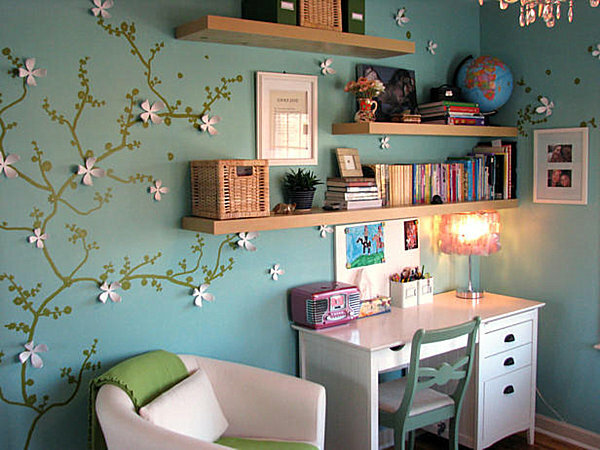 If the room is a shared space, creative solutions can help give both teens privacy. 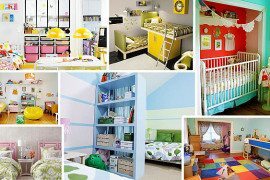 In the room below, a curtain serves as a hip divider, and the personality of each teenager is honored by colorful decor. For product details, visit IKEA. For the ultra modern teen, hip lighting sources and striped bedding put their contemporary stamp on the space, yet pink accents on the rug and side table add a feminine touch. For product information, check out CB2. Or go for the unexpected with a neutral palette and quirky details like a collection of hanging mirrors. For more information, check out CB2. 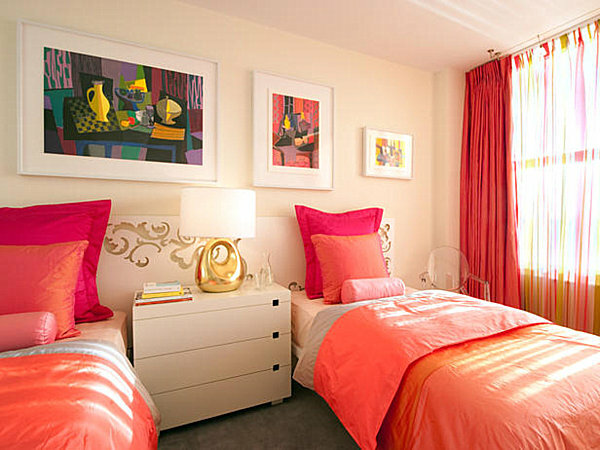 This next bedroom was also featured in the above-mentioned Decoist article on teenage girls’ room inspiration. The space, also known as the Zebra Hampton Bedroom from PB Teen, features black and white textiles that establish a distinguished vibe. Not to mention, a collection of photos and shadowbox-framed art pieces add true creativity. For product details, check out PB Teen. Sometimes a wall mural is the way to go! This woodsy, artistic room is both functional and stylish. In fact, this Bohemian Chatham Bedroom from PB Teen was also featured in our previous post on teen girls’ rooms. For product details, check out PB Teen. Bring on the fairy tale… The Georgina Headboard from Serena & Lily is inspired by an antique Portuguese design. A white finish shows off the piece’s ornate form. Horses and parrots make an appearance in the decor, as does the lattice pattern on both side table and ottoman! Below we see another piece inspired by Portuguese design–the Bristol Headboard from Serena & Lily. Even though the piece has an old-fashioned feel, it easily mixes with modern seating and a contemporary geometric rug. The pink upholstered Octavia Headboard from Serena & Lily is inspired by classic Greek key patterns and accented with nailhead trim. Damask bedding and a bird motif lamp add to the space’s feminine feel. Sophistication can be as simple as an upholstered headboard, bubble base lamp and subtle bedding. The Ditsy Dot Raleigh Bedroom from PB Teen boasts all three! For product information, check out PB Teen. Hotel-style bedding and a capiz shell chandelier are eye-catching elements of the Suite Upholstered Bedroom from PB Teen, shown below. Note how blue fabric pops against the beige walls. For product details, check out PB Teen. Teens should be involved in planning the look of their spaces. When choosing an overall palette, bedding is a great place to start. If finding the perfect comforter proves tricky, go with a solid and accent with printed pillows, curtains or upholstered seating. Most importantly, keep in mind that while the spaces above may look flawless, no room is perfect. The teen bedroom should reflect the personality of its inhabitant, complete with prized photos, beloved mementos and yes, even a little clutter from time to time!